The boundary between Virginia and Maryland was established by multiple colonial charters, two negotiated settlements by the states in 1785 and 1958, an arbitrated agreement in 1877, and several Supreme Court decisions. 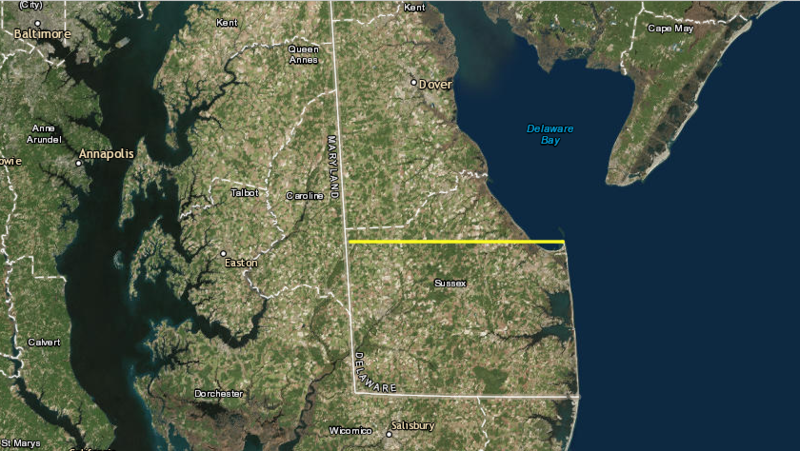 The details of the Potomac River boundary line, and the boundary on the Eastern Shore separating Accomack County in Virginia from Worcester/Somerset counties in Maryland, were not defined easily. The Potomac River divides Maryland and Virginia, but Virginia does not own half of the Potomac River. 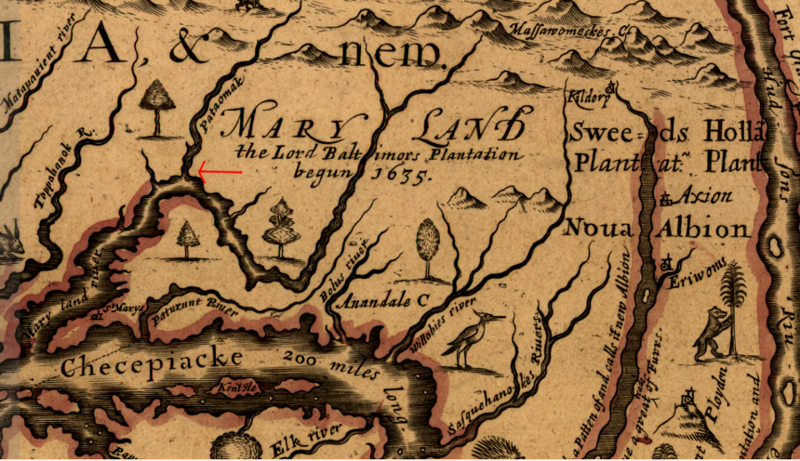 The Maryland-Virginia boundary is next to the Virginia shoreline at the low-water mark in most places; the line separating Maryland from Virginia is not in the middle of the river. - today, if you want to get married on a boat in the middle of the Potomac River while looking at Mount Vernon, you need a Maryland marriage license. - bridges crossing the Potomac River are almost completely in Maryland... and the dreams of Virginia transportation planners to build new bridges across the Potomac River in Loudoun/Prince William counties can be blocked by Maryland, which has expressed clear opposition to road projects that would extend urban sprawl further into Montgomery/Charles counties. Three charters issued by James I between 1606-1612 included most of what is now Maryland within the boundaries of the Virginia colony. 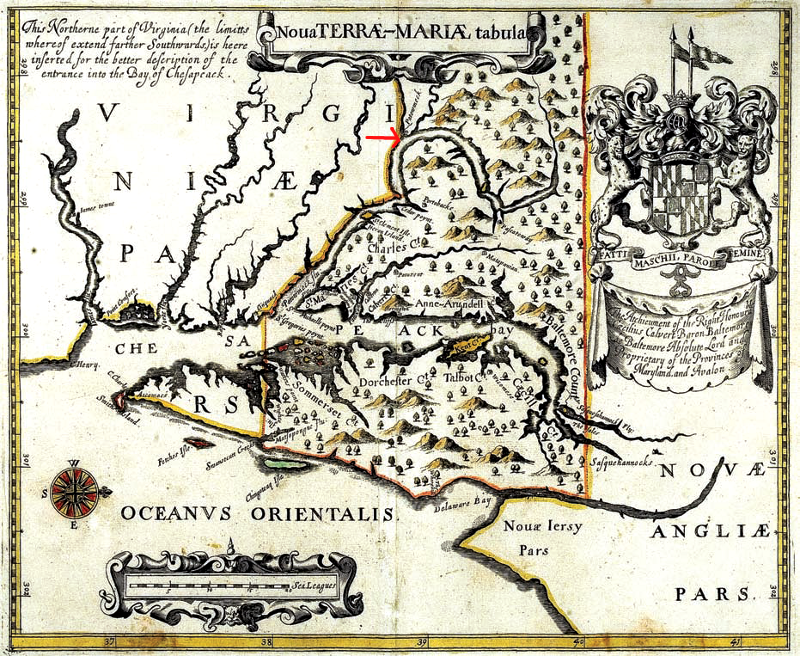 After James I revoked Virginia's charter in 1624 and converted it into a royal colony, there were no constraints on how the king could alter the boundaries of Virginia. In 1632, King Charles I granted a charter to Cecil Calvert, Baron of Baltimore, and reduced the size of Virginia. The king gave to the Calverts the land south of the south of the 40° ° line of latitude to the Potomac River. That grant included the northern part of the Delmarva Peninsula and the top of the Chesapeake Bay, plus all of the Potomac River. The Calverts named their new colony after the wife of Charles I, Queen Henrietta Maria. An earlier colony founded by George Calvert on the island of Newfoundland was called Avalon, but Maryland provided some political advantage by honoring the king's wife. 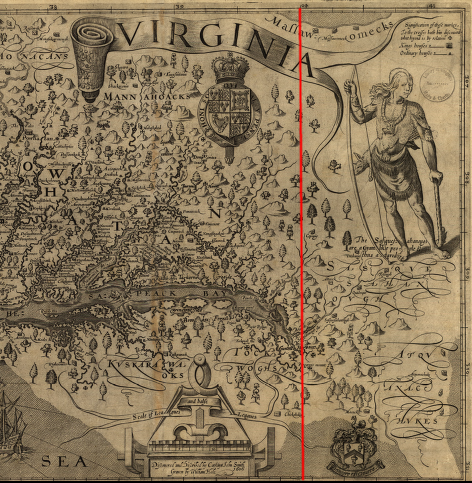 Virginia colonists had sought royal favor in the same way, naming their colony after the "virgin queen" Elizabeth and naming the first town after James I. The original plan of Charles I had been to reward Cecil Calvert's father George. 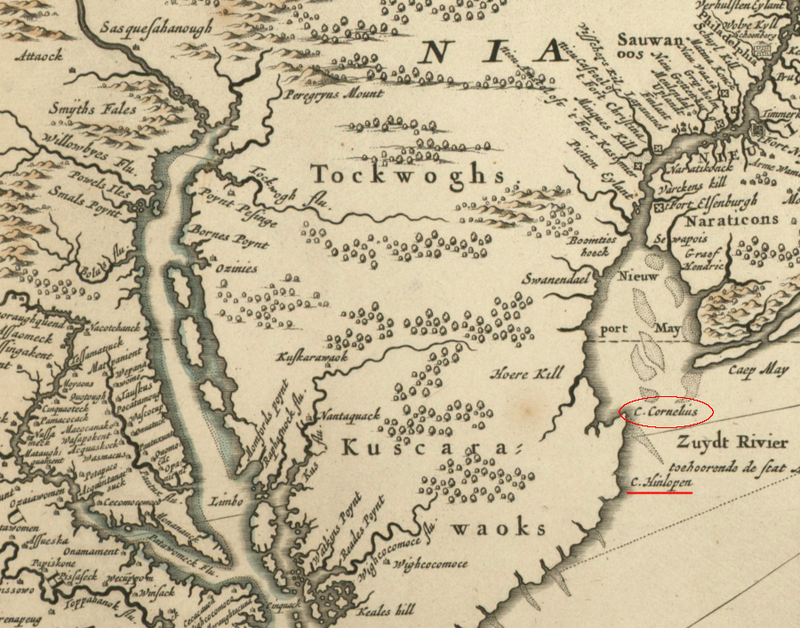 George Calvert had considered asking the king for land between the James and Chowan rivers, picking off the southern end of the Virginia colony. The area was not "unoccupied," but land claims by Native Americans were not a factor in drawing the boundaries of English colonial charters. The northern boundary of the new colony of Maryland was defined by drawing a line due west from the ocean along the 40 degree parallel, the southern boundary of the New England grants, until getting to a point due north of the beginning of the Potomac River. In reality, the 40 degree parallel was located further north where Philadelphia is now located, creating an overlapping claim to land after William Penn was granted a charter for a new colony in 1681. Maryland and Pennsylvania argued about their border until the Mason-Dixon Line was surveyed in 1767 by Charles Mason and Jeremiah Dixon. The western boundary of Maryland was based on the location where the Potomac River started, along a line running directly south from the 40th parallel (at least that's what they thought in 1632...) to the spring at the headwaters of the Potomac River. The Deakins Line was surveyed in 1788, starting at the sandstone monument (the "Fairfax Stone") that had been erected in 1746 and moving north to the Pennsylvania-Maryland line. 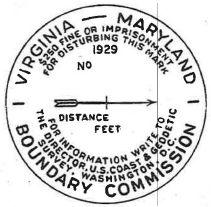 in English: unto the further Bank of the said River, and following the same on the West and South, unto a certain Place, called Cinquack, situate near the mouth of the said River. 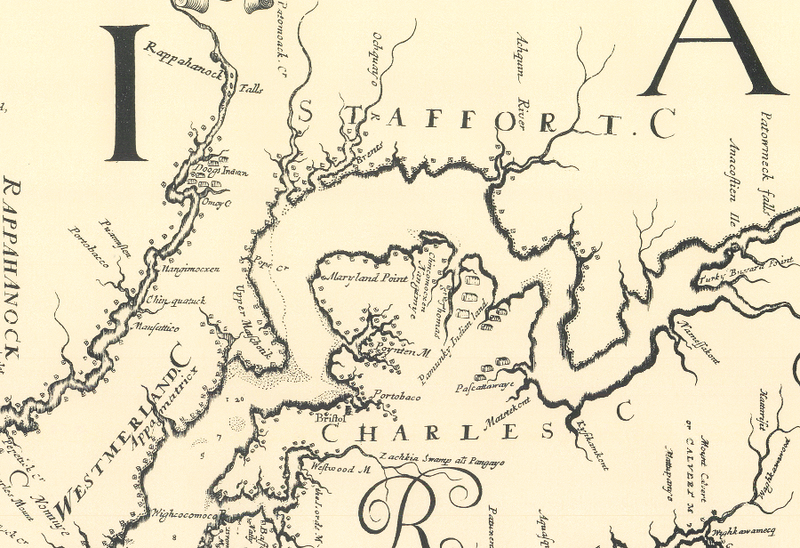 No one knows why the 1632 charter was so generous to Maryland, giving the entire Potomac River to Maryland instead of drawing the boundary in the middle of the river. The decision may have been intended to give Maryland officials an extra measure of control. George Calvert had visited Jamestown with his family in 1629, and the Virginia colonists had demonstrated their distrust of him both as a Catholic and a potential rival. Another possibility is that no one in London cared much about the details of the boundaries, far across the Atlantic Ocean. In Lord Calvert's earliest maps of the colony, the location of the Potomac River was defined to Maryland's advantage. By defining Potomac Creek or Aquia Creek as the main stem of the river, the land to the north (starting at modern Stafford County) would be incorporated into Maryland. It is hard to believe such efforts reflected ignorance of which stream was the main Potomac River. The first European known to have explored the area, John Smith, had clearly recognized in 1608 which channel was the main Potomac River and which creeks were the smaller tributaries. The territories, contained within the Charters, erecting the Colonies of Maryland, Pennsylvania, North and South Carolina, are hereby ceded, released, and forever confirmed, to the people of these Colonies respectively, with all the rights of property, jurisdiction and government, and all other rights whatsoever, which might, at any time heretofore, have been claimed by Virginia, except the free navigation and use of the rivers Patomaque and Pokomoke, with the property of the Virginia shores and strands, bordering on either of the said rivers, and all improvements, which have been, or shall be made thereon. Left unclear was determination of the location of the actual line on the south bank, the "further Bank of the said River" (in Latin, ad ulterioram predicti fluminis ripam). Virginians were not legalistic about defining the edge of the shoreline, or even respectful of Maryland's claim to the entire river. In Tidewater, the rise and fall of the tides can produce a wide, sandy beach/mudflat on the river's edge. A literal interpretation of the 1632 grant to Lord Baltimore might suggest the boundary was set at the high-water mark. 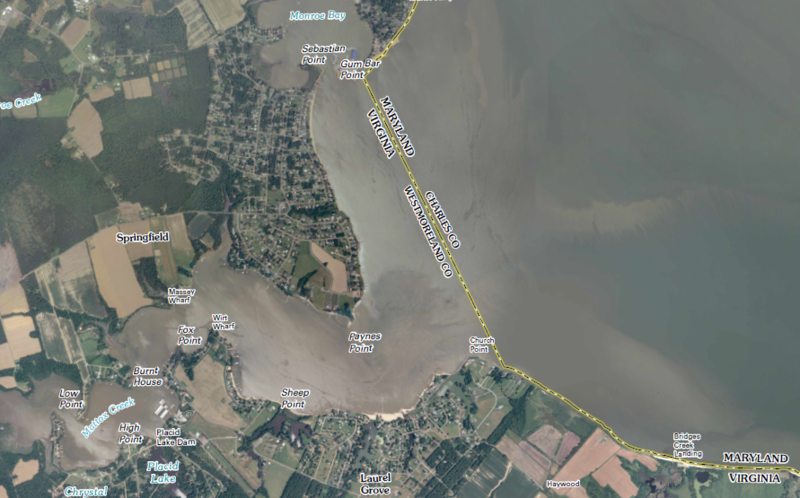 Virginia landowners chose to interpret the right of "navigation and use" to include using the shoreline down to the low-water mark. Wharfs were built on the shore at plantations such as Stratford Hall, with no consideration of paying Maryland taxes for the shoreline real estate. After the American Revolution, the new United States was only a loose confederation, governed by a weak national Congress. Maryland had refused to ratify the Articles of Confederation until 1781, maneuvering Virginia and other states into ceding their western lands claims (beyond the Ohio River) to the new national government first. Maryland could have asserted its right as an independent state and its claim to the Potomac River, and tried to tax commercial traffic going to Virginia ports such as Alexandria. However, it was not clear how Maryland could enforce any claim based on the now-rejected authority of English kings. Virginia still remained the largest, most-populated state in the new nation, and the "United States in Congress Assembled" under the Articles of Confederation might not support ancient land grant claims by Maryland against Virginia. In 1785, there was no judicial referee to resolve interstate conflicts. The idea of a Supreme Court, operating as an independent third branch of government, would not be established until the Constitution was ratified in 1788 and the court asserted its independence over the next 20 years. It was unclear how a weak national Congress could force Virginia to comply with Maryland's interpretation of its 1632 charter. 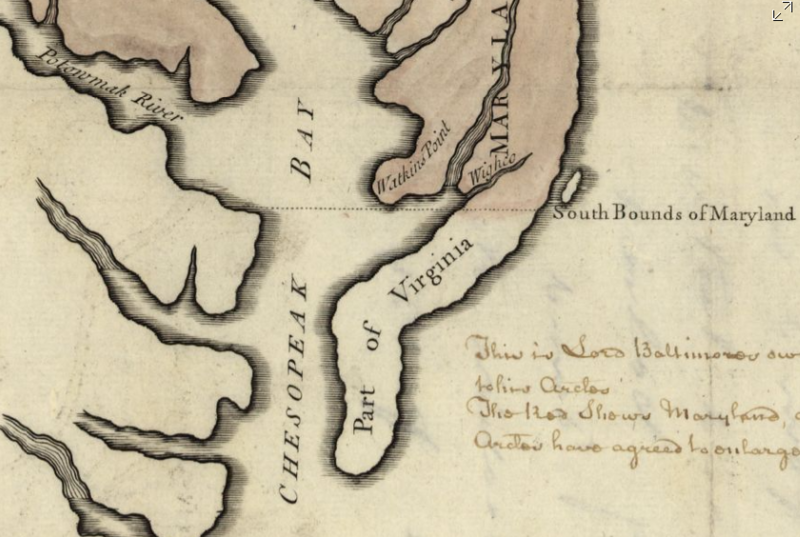 Besides, Virginia had real leverage to convince Maryland to resolve conflicting claims to use of the Potomac River: Virginia owned the mouth of the Chesapeake Bay. 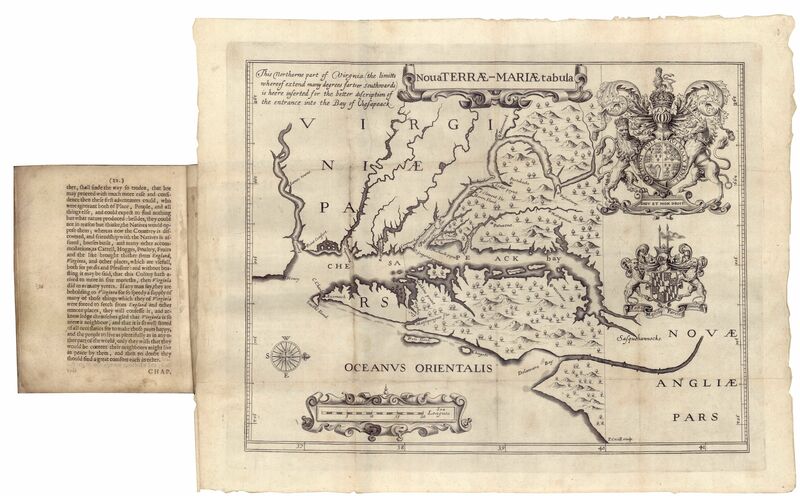 Virginia was an independent state that could tax all Maryland ships coming from the Atlantic Ocean into the Chesapeake Bay, before they sailed north to "Maryland's" Potomac River. The tradeoffs to reach agreement were based on the shape of the bay as well as the colonial boundaries. While Maryland might own the Potomac River, Virginia controlled the entrance to the Chesapeake Bay. Under the Articles of Confederation, Virginia could impose a high tax on all vessels sailing between Cape Charles and Cape Henry on the way to the Potomac River. All of Maryland's significant ports were on the bay and the rivers draining into the bay, such as Annapolis and Baltimore. 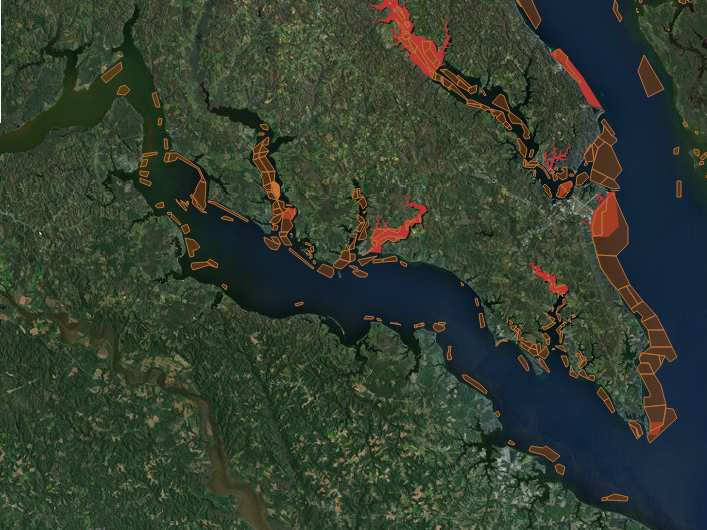 There were no good harbors on Maryland's Atlantic coastline. As a result of natural and political geography, nearly all commercial traffic going to (or from) Maryland could be forced to pay an import or export fee on their cargoes passing through Virginia's portion of the Chesapeake Bay. Bottom line: each state could wreak economic havoc on the other. The solution was to negotiate, in order to encourage rather than block each state's commerce and economic development. Maryland supported chartering the Potowmack Company in 1784, which would benefit both states, and agreed to send delegates in 1785 to a meeting regarding commercial use of the river. Each state appointed commissioners to negotiate a compact. The commissioners met initially in Alexandria, then moved to Mount Vernon. In part because George Washington hosted the discussions (even though the Virginia General Assembly had not designated him as a commissioner), the negotiators crafted the Compact of 1785 and the General Assemblies of both states ratified the deal. The commonwealth of Virginia disclaims all right to impose any toll; duty or charge, prohibition or restraint, on any vessel whatever sailing through the capes of Chesapeake bay to the state of Maryland, or from the said state through the said capes outward bound; and agrees that the waters of Chesapeake bay, and the river Pocomoke, within the limits of Virginia, be for ever considered as a common highway, free for the use and navigation of any vessel belonging to the said state of Maryland, or any of its citizens, or carrying on commerce to or from the said state, or with any of its citizens, and that any such vessel, inward or outward bound, may freely enter any of the rivers within the commonwealth of Virginia as a harbour, or for safety against an enemy, without the payment of port duties, or any other charge; and also that the beforementioned parts of Chesapeake and Pocomoke river be free for the navigation of vessels from one port of the state of Maryland to another. Through that statement, Virginia traded away its theoretical ability to impose tolls on Maryland vessels entering the Chesapeake Bay between Cape Charles and Cape Henry, near Norfolk. In exchange, Virginia was guaranteed free access to the Potomac River. The commissioners called for another meeting among all the states to address larger interstate commerce issues. This led to the Annapolis Convention, which begat the Constitutional Convention in Philadelphia in 1787, which begat the Constitution and the current political structure for the United States of America. The Virginia/Maryland border dispute triggered the conflict resolution process that led to the Commerce Clause authorizing the new Federal Government to "regulate commerce with foreign nations, and among the several states, and with the Indian tribes." To get a sense of the challenge under the Articles of Confederation to resolve the interstate conflict over the rights to the Potomac River, look at today's debates over the relative authority of individual states in the European Union. In 1785 it was not clear that the 13 new states would remain under one federal government, just as the future of the European Union is unclear today. The development of the Constitution was not pre-ordained, and the leaders of the newly-independent states had no crystal ball showing that a new Constitution would change the authorities of the individual states. 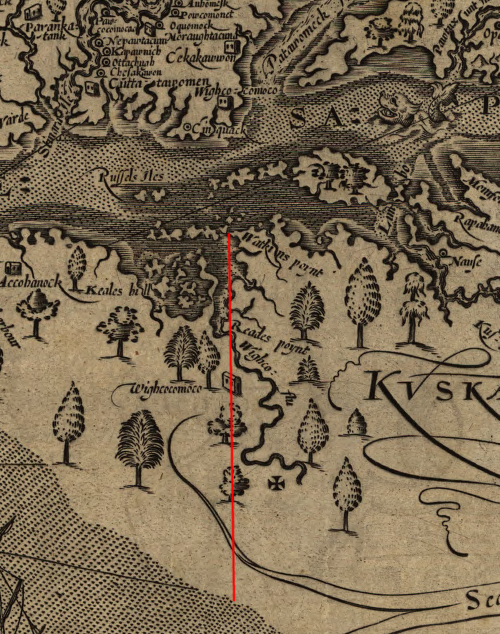 However, the Compact of 1785 did not fix the location of the boundary line along the Potomac River, or clarify if the high-water mark or the low-water mark should be used. Ultimately, a lawsuit in the District of Columbia led to a US Supreme Court decision that determined ownership of the shoreline, and surveys that marked a fixed boundary on the southern bank of the Potomac River. Had the Chesapeake and Delaware Canal been built before the Compact of 1785, ships would have been able to sail between Baltimore and the Atlantic Ocean without having to use the mouth of the Chesapeake Bay and sail through Virginia waters. Without the leverage of control over traffic in the lower Chesapeake Bay, Virginia would have been in a weaker position to bargain with Maryland. Virginia's rights to use the Potomac River, including extension of wharves from the shoreline, may have evolved differently. Determining exactly where to draw the boundary line was a political, surveying, and legal decision. Rather than ask the Supreme Court to make a decision, Virginia and Maryland agreed to a commission of arbitrators. Their final decision is known by the name of two of the three commissioners, Jeremiah S. Black of Pennsylvania and Charles J. Jenkins of Georgia. The third commissioner, James B. Beck of Kentucky, did not agree with the boundary decision for the Eastern Shore section. 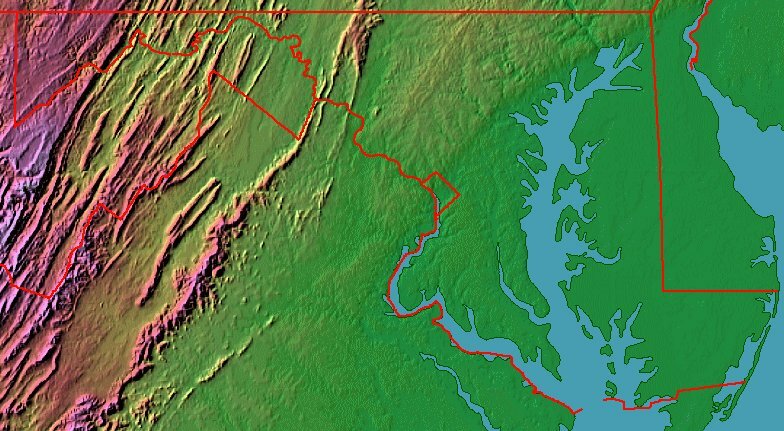 In the Black-Jenkins arbitration decision of 1877, Maryland's boundary was determined to be the low-water mark on the southern shore of the Potomac River. Maryland's 1632 charter had granted it ownership of the Potomac River shoreline up to the high-water mark, unto the further Bank of the said River. 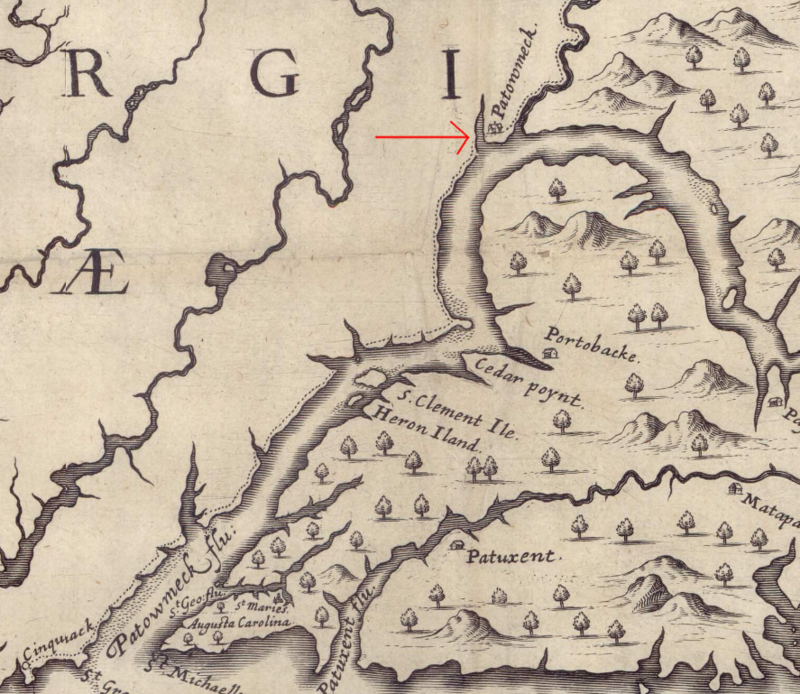 The arbitration decision modified the Virginia-Maryland boundary along the Potomac River, as defined by a literal interpretation of the language in the charter given by Charles I to the Calverts. The size of Virginia expanded slightly. Maryland lost the land between the high-water mark and the low-water mark because of "prescriptive use" of that riparian area by Virginians since the Compact of 1785. 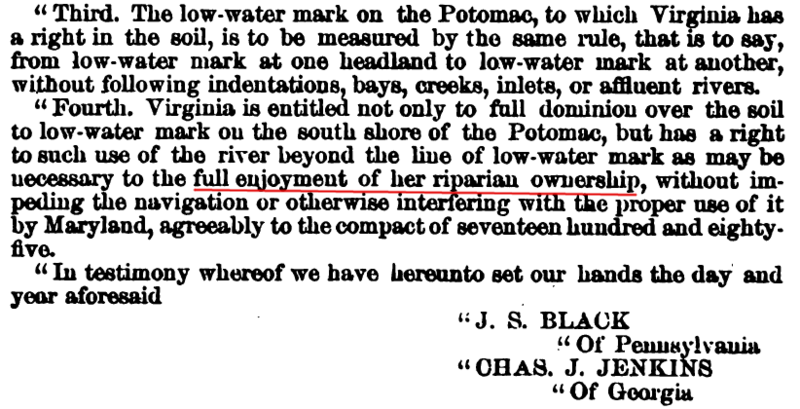 Since Maryland had not objected effectively to Virginians using the shoreline between the high-water and the low-water mark, the arbitrators decided that the line of traditional use should be adopted as the boundary. The record discloses no evidence that at any time any substantial claim was ever made by Lord Fairfax, heir at law of Lord Culpeper, or by his grantees, to property rights in the Potomac River or in the soil thereunder, nor does it appear that Virginia ever exercised the power to grant ownership in the islands or soil under the river to private persons. Her claim seems to have been that of political jurisdiction. from low-water mark at one headland to low-water mark at another, without following indentations, bays, creeks, inlets, or affluent rivers. 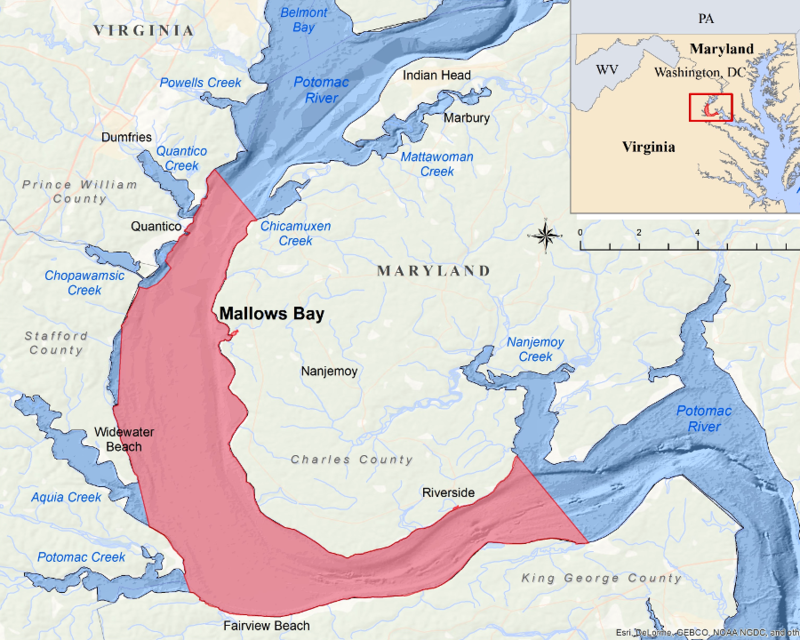 Shallow-water embayments were granted to Virginia, and the Maryland-Virginia state line crossed between points of land (headlands) jutting into the Potomac River. As a result, the state boundaries downstream from Jones Point do not follow the shoreline exactly, and the boundaries do not change when land is eroded away from the shoreline or accreted to it. The Mathews-Nelson line simplified the challenge of determining jurisdiction in coves along the Virginia shoreline, replacing the low-water mark as the boundary between those headlands where straight lines were marked by 58 concrete monuments. The low-water mark boundary was not altered upstream of Jones Point by the Mathews-Nelson survey. 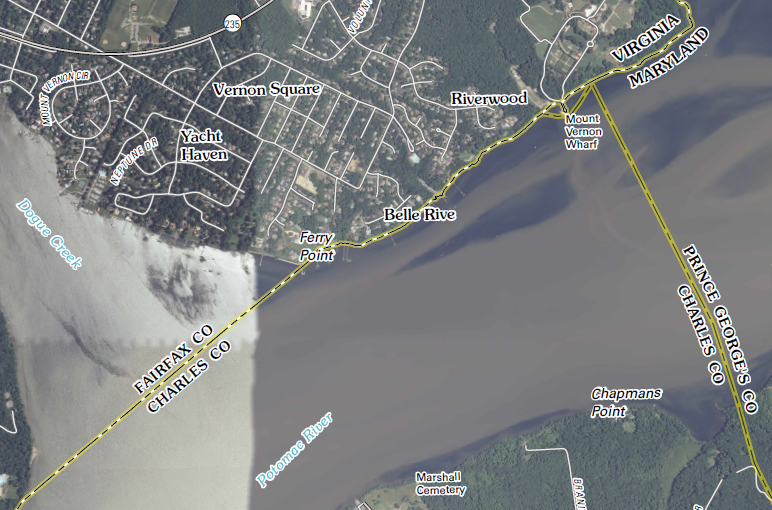 In 2014, a court determined that the normal alteration of that shoreline would shift the boundary as well, ensuring that all the land above the low-water mark on the Virginia side would stay in Virginia. In 1940, Congress gave its consent to a new interstate compact for managing the Potomac River. 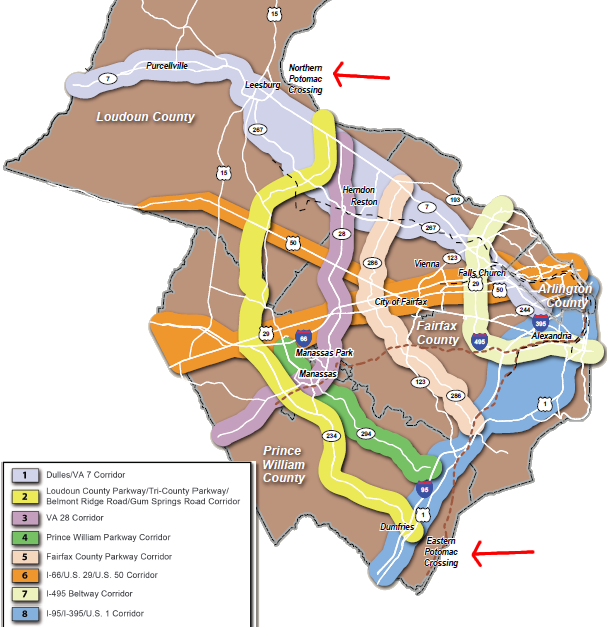 Maryland, West Virginia, Pennsylvania, Virginia, and the District of Columbia entered into a Congressionally-approved compact that created the Interstate Commission on the Potomac River Basin (ICPRB) and the Potomac Valley Conservancy District, to address water quality and related land resources issues in the Potomac River watershed. In the 1950's, the dispute between Maryland and Virginia over rights to oysters and other resources in the Chesapeake Bay/Potomac River turned violent again. 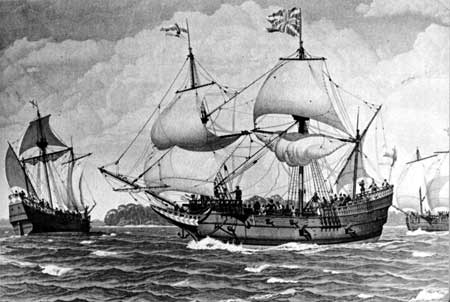 Both states armed patrol vessels and renewed "Oyster Wars" led to a effort to abrogate the Compact of 1785. Virginia started a lawsuit at the Supreme Court, but state officials were able to negotiate their differences and replaced the Compact of 1785 with the Compact of 1958. The 1958 agreement established the Potomac River Fisheries Commission, defined the jurisdictional boundaries for that commission's powers (in great detail for the Maryland side of the Potomac River, but simply referencing the mean low-water mark of the Potomac River on the Virginia side, as marked by the Matthews-Nelson Survey of 1927). After both the Virginia and Maryland legislatures and the Maryland voters approved the 1958 agreement, Congress affirmed it in 1962. In 2003, another US Supreme Court decision reaffirmed that the 1877 Black-Jenkins arbitration decision gave Virginians the right to use the riparian area beyond the low-water mark. 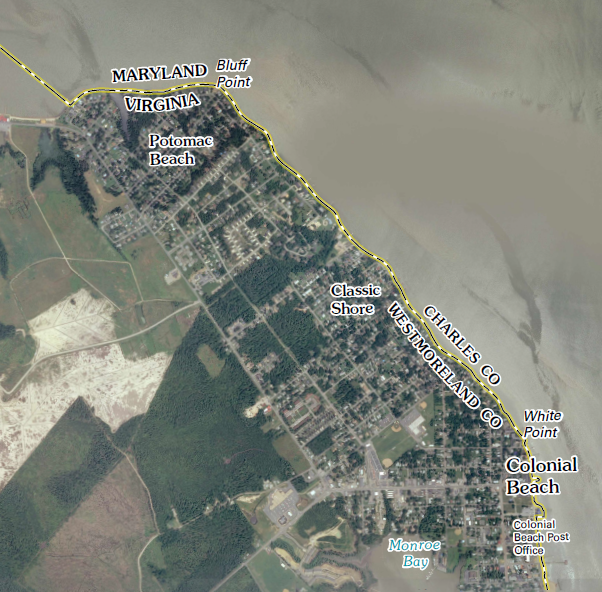 Structures could extend from the Virginia shoreline, intruding into Maryland, without having to get permission from that state. Maintaining ownership of the Potomac River was the only boundary fight in which Maryland managed to maintain most of its original claims. It lost battles with Pennsylvania to define the eastern and northern sides of the colony. The 1632 charter for Maryland defined its boundary "unto that Part of the Bay of Delaware on the North, which lieth under the Fortieth Degree of North Latitude." The geography surprise was that the 40th parallel of latitude was further north than expected. It ran through what became Philadelphia, not through the northern tip of the Chesapeake Bay. A circle with a twelve miles radius centered on New Castle did not intersect the 40th parallel, so a key spot used to define the Maryland-Pennsylvania boundary did not exist. 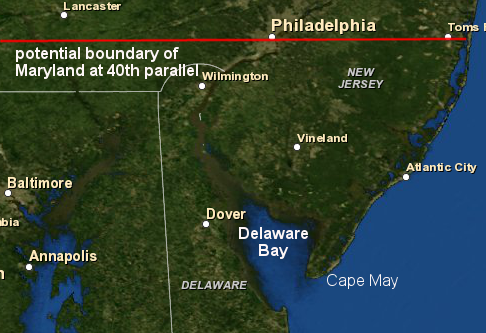 If the Calverts had succeeded in getting the 40th parallel defined as the boundary, then Maryland would have controlled the mouth of the Delaware River. Maryland's control of the Delaware Bay entrance would have been comparable to Virginia's control of Cape Charles/Cape Henry at the mouth of the Chesapeake Bay. All ships sailed to Philadelphia through the Delaware Bay. Under the Articles of Confederation, Maryland might have taxed all ships going to and from the Delaware River to the Atlantic Ocean, constraining Pennsylvania's commercial development. The Calverts lost their fight with the Penns and were to accept a boundary line south of Philadelphia, 15 miles below the 40th parallel. 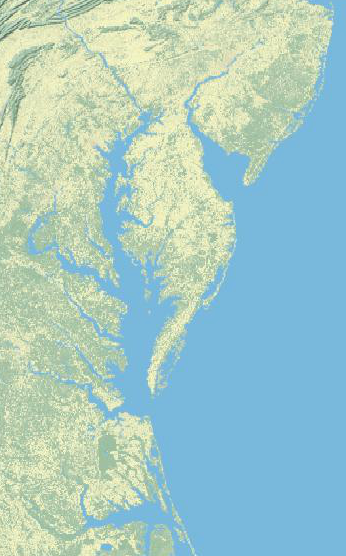 Charles Mason and Jeremiah Dixon surveyed the northern border of Maryland in 1763-1767. Pennsylvania also blocked Maryland from acquiring control of three counties along the western shore of Delaware Bay, territory that had been settled earlier by Swedes and Dutch. The three counties ended up becoming the separate colony of Delaware, while the eastern shore of Delaware Bay - including Cape May - ended up as part of New Jersey.